Saturday 27th October is “Make a Difference Day” – run by the Community Service Volunteers (CSV), it is the UK’s biggest day of volunteering, and provides opportunities for thousands of people to volunteer every year in activities across the country. The Friends of Parkinson’s Park, have therefore decided to dedicate our regular Saturday morning working party to a special project to ‘make a difference’ to the Park . 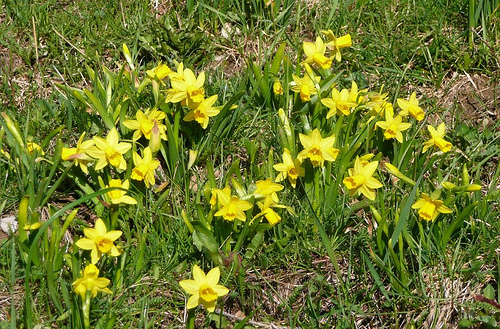 The task is to plan 500 small daffodil bulbs which have been given to us by the Groundwork Trust as part of their 2012 Bulb Bonanza! This year, Groundwork have given 80,000 daffodil bulbs to groups around Leeds who’d like to brighten up their local area, helping make the city a more colourful and cheerful place to live and work – the flowers just must be on public view come springtime. We also have four horse chestnut saplings to plant. These were grown by a local lady from the horse chestnut tree whose dead trunk stands near the field gate. If you are available and would like to, make a difference, then please congregate by the top Copse at 10am on Saturday 27th October. Please bring gardening gloves and a spade, trowel, or bulb planter. Feel free to bring along as many family members, friends, pets as you wish. We do have quite a lot of bulbs to get through! This entry was posted in Ecology, Events, Regeneration and tagged daffodils, Friends, horse chestnuts. Bookmark the permalink.